The other day I received an invitation in the mail for a baby shower for my sister-in-law who is due with twins this summer. Tucked in the envelope along with the invitation was a bookplate that read, "This book belongs to ____________ It was a gift from ____________" and a request to bring a favorite book to help grow the babies' library. I love this idea and I wish I had thought of it for my sister's shower in March. If you would like to use this idea for a shower you are planning there are a multitude of sellers on Etsy selling book plates. The following are a few of my favorites: Taylored Arts, Taylor Made Designs, Pixels Plus Paper, Paper and Ink Studio, and Stasia Burrington Illustrations. 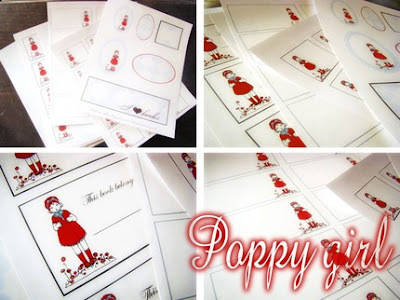 Taylored Arts has generously donated a download-able Poppy Girl Stationary set for one lucky Namesake reader that includes, 1 sheet small gift tags, 1 sheet large gift tags, 1 sheet misc. 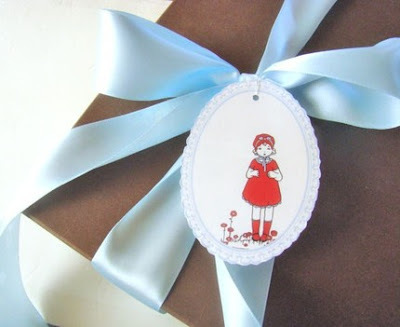 gift tags and book mark, 1 sheet flat note card- prints 4 per sheet, 1 sheet folded note card, 1 sheet background pattern, 1 sheet bookplates, and 1 sheet half sheet flat note card. 1) Leave a comment on this post that includes your favorite children's book. 2) Blog about this post on your blog and post a link to your blog in the comments. For more chances to win, you may enter all three ways. Entries must be completed by 5 PM EST on Thursday May 28. The winner will be announced on Friday May 29th, which is also the one year anniversary of this blog. Bonne Chance! Great giveaway and happy blogiversary, Amanda! I love your blog, of course! Our favorite children's book right now is "Dog Breath" by Dav Pilkey. Miss you all! My favorite children's book is Make Way for Ducklings, with Cloudy with a Chance of Meatballs close behind. I loved those two when I was a kid and I still have my copies. Oh, how funny! I know, the idea of bringing a childhood book is so special. Our favorite book is 'Caps for Sale'! Thanks for stopping by!! I'm now a follower! Great blog, btw! My favorite books were the Amelia Bedelia series. Amelia was a quirky character who, in each book, would be given a set of instructions that she would routinely "goof up" by innocently taking each task literaly (e.g. when told to 'draw the drapes', she sketched a picture of the window treatments and when asked to 'dress the turkey', the bird would be wearing a newly knitted sweater). At the end of each book, she would do something wonderfully sweet for the family that made them appreciate her, and focus on her kind soul and good intentions more than her flaws. This reasonated with me, given my neurotic personality and somewhat unconventional ways of perceiving and accomplishing things. I remain weird yet wonderful today!